Ever wondered what it’s like to open a brand-new unit? Karen Quinn from 5th South Ruislip Rainbows tells us about her experiences. 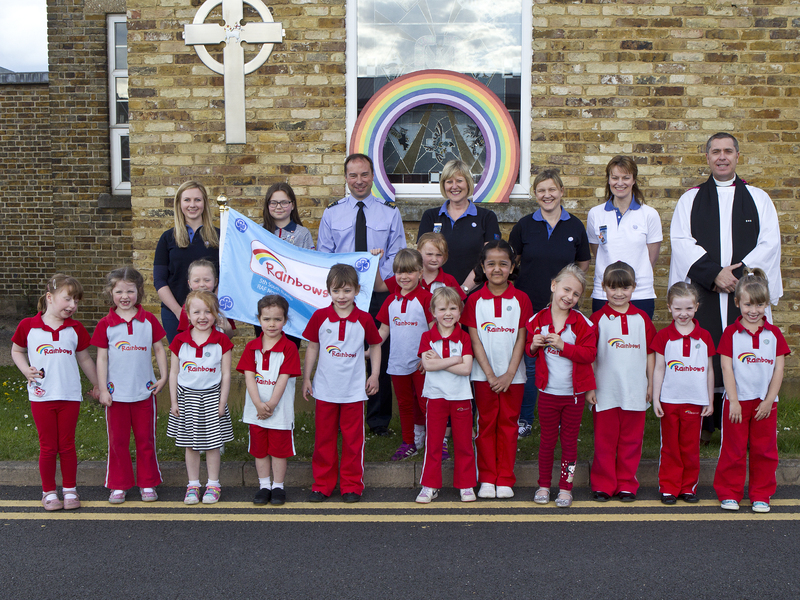 On Thursday 5th March 2015 South Ruislip Rainbows opened its doors for business. In the space of five very short but busy months a conversation about the need for a new Unit (with our local commissioner, Nicky Fantham, and the Station Commander Royal Air Force Northolt, Group Captain Andy Bacon) finally became a reality. As a newly qualified leader what could have been an overwhelmingly ambitious vision was made all the more achievable by the support I received from our Guiding District, the local community and pivotally the Royal Air Force. Belonging to a military service family, it had always struck me that many service children often miss out on Guiding; the waiting lists coupled with the inevitable relocation these children are faced with every few years. Many military parents are reluctant to add their daughter’s names to a list that may only come to fruition when they are due to be posted. We wanted to open a Unit that offered opportunities for the daughters of military personnel, whilst including local non-military children. The priority was establishing a leadership team and within a few weeks of advertising at RAF Northolt we secured two Assistant Leaders. This allowed us to advertise 16 places to the daughters of both military and civilian families. At every step our Commissioner supported us along with the already established local Rainbow Leaders. All embraced the vision and help came in the form of advice, planning and lots of boxes of resources! The Station Commander helped us secure a venue – the Integrated Welfare Facility (part of RAF Northolt). It is conveniently positioned within the Station estate so that all our families can access it. We were bowled over by the support from RAF Northolt. Serco, the Defence Contractor on Station, providing us with custom made polo shirts (our ‘away’ strip), Station Workshops made us a wooden Rainbow and the Station Tailor also made our Unit Flag. Our promise Ceremony was a grand affair; the Station Padre presided over events and the Station Commander presented the girls with their Promise badges and certificates. What 5th South Ruislip lack in experience we like to think we make up for in enthusiasm. Not ones to shy away from an adventure, our summer term programme ended in us arranging a Rainbow Sleepover for 5 Units in our District. 44 girls and 12 leaders took part and all agreed it was a fantastic experience. Some of the girls had never spent a night away from Mum and Dad and all of them were awarded their sleepover badge. The enduring memory for the leaders was being woken at 5am by the girls doing a mass conga around the Willow Tree Centre! There is no doubt that the girls have enjoyed a fun programme this term: from Bee Keeping to Road Safety to Dinosaur Golf. This Autumn RAF Northolt have offered us a visit to the Police Dog Section to experience what life is like for a working dog in the military. No 32 (The Royal) Squadron will also be hosting the Unit and the girls will get the opportunity to explore Her Majesty’s aircraft. We are proud of how far we have come in a short space of time. Our girls, from both military and non-military families, have come together under the umbrella of Guiding and gained an insight into, and understanding of, each other’s lives. Lasting friendships have been made and lots of fun has been had. Pictured here are the 5th South Ruislip Rainbow Unit making their promise and receiving their badges from the RAF Northolt station commander Group Captain Bacon. Photograph taken by: Corporal Ben Tritta on 30 April 2015.